It is a common habit that after a meeting or lecture we forget to unmute our mobile phone. Similarly, if we reach a seminar, lecture or prayer in hurry we often forget mute our mobile phone and it becomes quite an embarrassing if during this our mobile starts ringing. ICT Innovations has developed MuteMe android application that is able to mute and unmute automagically based on your entered schedule that can be time-based and location-based. You can mute, unmute or vibrate the mode of your mobile speaker. Location-based schedule mutes or unmutes your android phone when you reach within 50 meters of radius of your tagged location. For saving location-based schedule, you are required to be connected with internet. When you tag a new location, location-based schedule loads your current location on map. It may take a little time to load you current location depending upon the speed of your internet connection. Once map is loaded, you can move to any other location by moving/scrolling the map and tag your desired location. Time-based schedule allows you to enter as many schedule as you want. This application will mute or unmute your mobile phone based on these schedules. For example, if your lecture starts at 10:00am in the morning and ends at 11:15am. You don't have to manually mute at the start of the lecture and then unmute when lecture finishes. You can set your mobile to be silent from 10:00am to 11:15am. You can also set a schedule to be repeat or once only. 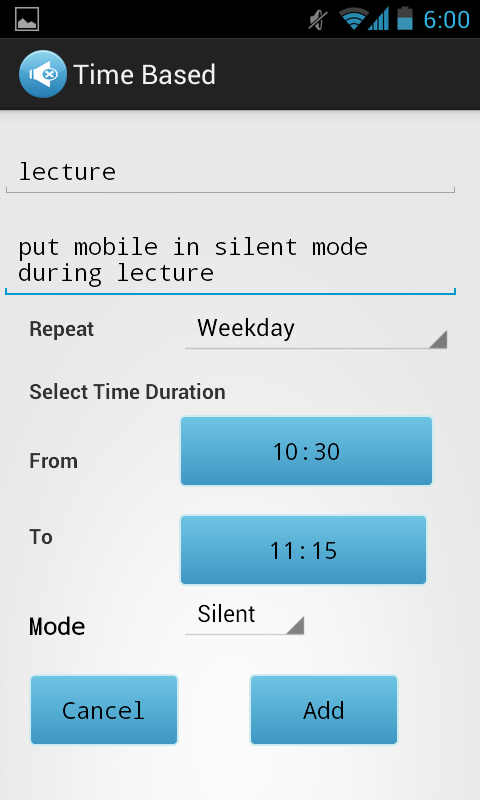 A once only schedule will silent your mobile only once and then will become "off". A repeat schedule will silent your mobile during the weekdays. You can customize which days of the week you want your schedule to run. A repeat schedule will always be "on". You can set it to be "off" if you want to deactivate it. Main tab shows all the created schedule in a list. By clicking on the list item, it will turn it on/off. By long pressing the item, it will show dialog box with 3 different options: information about the schedule, edit a schedule, remove a schedule. There is also a help tab which guides a user how to use this application.